Quick – what do Eric Carmen’s hit song “Never Gonna Fall in Love Again,” Don Sebeskey’s “You Can’t Go Home Again,” Barry Manilow’s “If I Should Love Again,” Danilo Perez’s “If I Ever Forget You,” and the film Birdman all have in common? Yes, the all “borrow” from Rachmaninov’s brilliant Symphony No. 2. While Birdman used parts of the first and second movement, it’s the third movement’s theme that inspired everyone else – and indeed, it is one of the most achingly beautiful themes in all of classical music. After the failure of his first symphony, Rachmaninov slipped into a depression that lasted years. He went into therapy and finally began to compose again. His first major composition after that was his second piano concerto (dedicated to his therapist), which was an instant success and remains one of the greatest and most well-loved and well-known piano concertos of all time. Confidence renewed and strong, he began writing what would become his second symphony. He composed throughout 1906 and finished the symphony in 1907, after many revisions. He himself conducted the premiere in 1908, where it was met with much acclaim, the polar opposite of the reaction to the first symphony. Through the years following the premiere, Rachmaninov made all sorts of edits to the symphony. Complete performances were almost unheard of until the late 1960s. The cuts to the complete approximately sixty-minute work sometimes reduced it to as little as forty minutes, sometimes even shorter. Which brings us to the performance on this disc – the legendary Hollywood Bowl concert of Leopold Stokowski conducting the Rachmaninov second symphony in August of 1946. In what was almost unheard of back then, Stokowski performed it without most of the usual cuts. The performance was electrifying. Thankfully, at the time there were transcription discs made of the performances for archival purposes. While there were copies of that disc, they suffered from the usual problems associated with those kinds of discs. In 1993, a CD was issued of the Stokowski performance. It was, of course, plagued with warbles, clicks and pops and ticks and was very difficult listening, although clearly the performance was one for the ages. However, thanks to a different reel-to-reel tape in better sound, audio restoration whiz, Chris Malone was able to work his magic some kind of magic and the result is the sound, while obviously still archival, is much improved and one can appreciate the musical magic the Stokowski and the Hollywood Bowl Symphony made. We hope listeners will agree that it was worth the time and effort (it took months) to now have this amazing performance available in the best archival sound possible. Listening to the second symphony, it’s not impossible to imagine that Rachmaninov could have been an amazing film composer. The adagio could have underscored any number of classic romantic scenes in any number of classic films, just as the final movement’s opening could have underscored any of Errol Flynn’s swashbuckling adventures. But even though he never wrote music for film, his music has been used in some all-time classics. It is unthinkable to imagine David Lean and Noel Coward’s Brief Encounter without the Rachmaninov music. The second piano concerto was used to hilarious effect in Billy Wilder’s film of George Axelrod’s The Seven Year Itch. And of course the grandly romantic time-travel film Somewhere in Time (based on the novel by Richard Matheson) used Rachmaninov to very touching effect. The imdb currently lists Rachmaninov music used in over 180 films and TV shows. As the companion piece to the Rachmaninov Symphony No. 2 we offer the wonderfully melodic and sprightly Robert Russell Bennett Concerto for Violin and Orchestra, as conducted by Bernard Herrmann with the London Symphony Orchestra for a live radio broadcast in 1956, with the great Louis Kaufman on violin, the man for whom Bennett wrote the concerto. The concerto was first released on CD by Bay Cities in the late 1990s. Bernard Herrmann was a wonderful choice to conduct and it’s hard not to listen to the first movement of this tuneful concerto and not hear echoes of Herrmann’s own music for films like The Devil and Daniel Webster. For this release, Chris Malone has further cleaned up that original tape, most of which sounds fine – there was some unavoidable tape wear and damage at the top of the slow movement and a few instances of distortion, but it’s the music that counts, not to mention Louis Kaufman’s beautiful playing, and it’s wonderful to have it back in print. 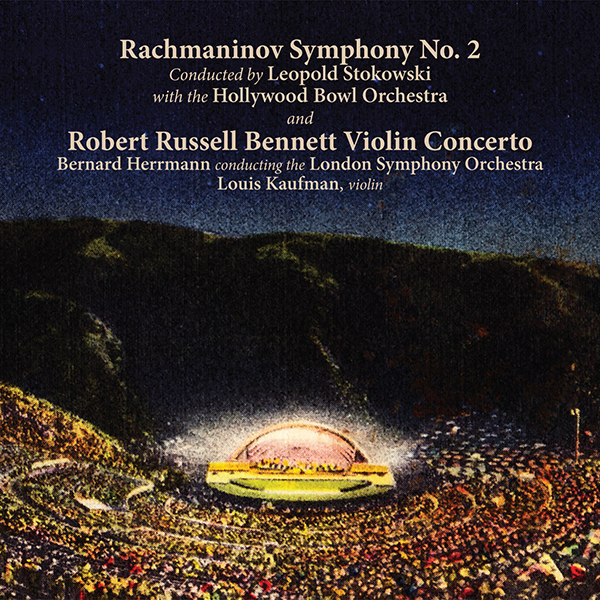 Rachmaninov Symphony No.2/Robert Russell Bennett Concerto for Violin and Orchestra is limited to 500 copies only and priced at $19.98, plus shipping. CDs will ship by the last week of October, but never fear, we’ve actually been averaging three to five weeks early in terms of shipping ahead of the official ship date. ATTENTION INDIEGOGO CONTRIBUTORS: IF YOU WANT TO RECEIVE THIS RELEASE YOU MUST OPT-IN BY SENDING US AN E-MAIL – SEND TO kritzerland@gmail.com. IF YOU DO NOT WISH TO RECEIVE IT, YOU DON”T NEED TO DO ANYTHING. IF YOU ARE NOT AN INDIEGOGO CONTRIBUTOR, ORDER AS YOU NORMALLY WOULD. THANK YOU.